The FADA event in Karnataka witnessed participation of over 150 established businesspersons and women entrepreneurs, who own and operate automotive retail business for passenger, two-wheelers and commercial vehicle manufacturers. The Federation of Automobile Dealers Association (F A D A) organized the State level conference ‘Vyapar Karnataka’ in Bengaluru. The event witnessed participation of over 150 established businesspersons and women entrepreneurs, who own and operate automotive retail business for passenger, two-wheelers and commercial vehicle manufacturers. Vyapar Karnataka was the first of the kind of symposium that had been held in the Bengaluru in last 15 years. Appraising the gathering about the Karnataka auto retail industry, he said that the industry provided direct employment to 3 lakh people and contributed ~ Rs. 8,000 crores to the exchequer by way of taxes. The changes that were sweeping the industry were as if the 4th industrial revolution was taking place. Hence, having discussion & dialogues amongst dealers was important as such interactions would open way to new opportunities. Mr. Ashish Harsharaj Kale, President, F A D A graced the occasion with his presence along with Dr M P Shyam, Chairman, F A D A Karnataka. Mr Manish Raj Singhania, Hony Secretary, F A D A, Mr. Nikunj Sanghi, Past President F A D A and Chairman, ASDC and Mr Vinkesh Gulati, Vice President, F A D A were also present at the event. 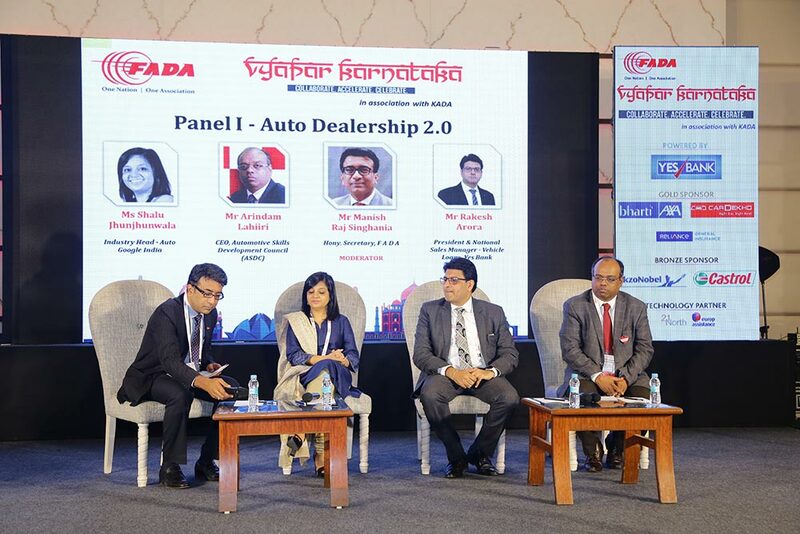 Various industry leaders shared their views during two panel discussions around ‘Auto Dealership 2.0’ and ‘Vahan 4.0’. We believe that the state of Karnataka has immense growth potential for the automotive retail business. The 7th edition of Vyapar was being held in Bengaluru. Coming times will see tsunami of changes in the times to come and the dynamics of business are set to change. He appraised the Karnataka dealers about F A D A and the role it was playing in helping dealers brace with the changes and in addressing dealers concerns and he asserted that F A D A shall always be at the forefront for its members. The participants gained valuable insights from the panel discussion on Auto Dealership 2.0 where Ms Shalu Jhunjhunwala from Google, Mr Arindam Lahiri from ASDC and Mr Rakesh Arora from Yes Bank discussed how dealership environment is set to change in times to come. Since Vahan is being implemented in the state, RTO and NIC officials apprised dealers how the new system will work and also answered many dealer issues raised during the event. Business achievers like Mr Ajith Mohan Karimpana and Mr P C Mustafa presented their case studies on food and furniture rental sector which made the dealers learn best practices from other industries. Mr Annadurai, an autowala from Chennai gave valuable sessions on how to delight a customer time after time. Vyapar Karnataka also witnessed for the first time the organisation of Open House discussions amongst 2W, PV & CV dealers on day to day operational problems they faced with F A D A & KADA office bearers. 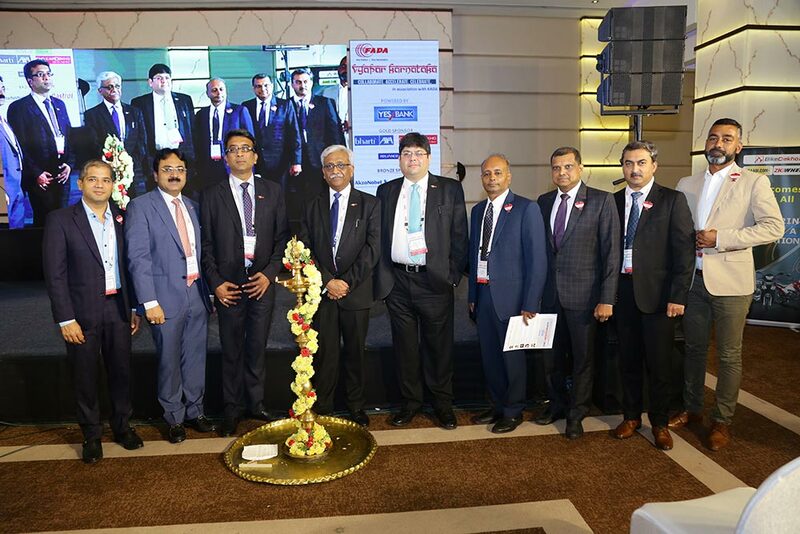 With the theme of the conference ‘Collaborate, Accelerate and Celebrate’, the event aimed at making the Federation every Auto Dealer’s one stop destination for the concerns pertaining to the Automobile Retail Industry. F A D A intends to address the challenges of the key stakeholders with the aim to keep up the positive momentum in the automobile industry.